The ancient Romans had it right: farro is a mighty grain. Farro is a hearty, toothy grain that perfectly complements a medley of vegetables, whether served hot or cold. When we sing of “amber waves of grain,” it’s probably not farro that most of us Americans have in mind. But maybe someday. Farro is commonly grown on the hills of Tuscany, and who wouldn’t admit we could learn a little something from the Italians? Evidently the soldiers of the ancient Roman Empire often fueled up on farro as they conquered the world. They were onto something. Farro is a whole grain low in gluten, high in protein, and filled with fiber. The carbohydrates it contains are “complex” (releasing slowly into the bloodstream), with a low glycemic index, meaning they won’t spike a person’s blood sugar but instead will provide long-lasting energy. For that reason, farro is a good bet for anyone with diabetes or trying to lose a few pounds. 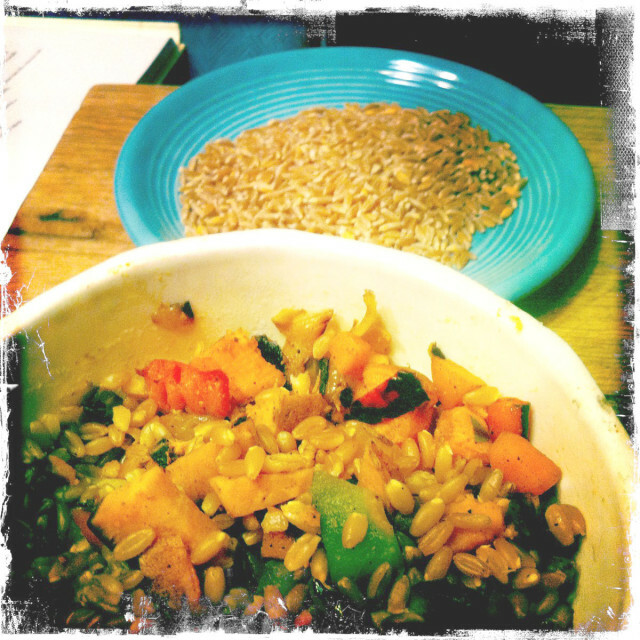 But for other reasons, farro is just plain good to eat. It’s delicious, with a nutty flavor and satisfying, toothy but not starchy texture that sets it apart from other grains like rice, couscous or quinoa. As an Italian staple, farro is used in soups or instead of rice in a risotto. It’s also great mixed with sautéed or stir-fried vegetables, or cooked and then combined with chopped raw veggies for a room temperature or chilled salad. Cooking farro will be faster if you soak it (overnight or less), but even without soaking, at about one cup of farro to three cups of water, it should take about 30 or 40 minutes to get to the grains to the perfect point of softness and substance. Farro is sometimes confused with spelt, which looks similar and is another rediscovered ancient grain that has come into 21st century popularity as an alternative to the overused and overcultivated wheat. And the nomenclature is confusing; suffice to say that farro is not spelt. Spelt is more commonly used these days ground into flour and used in combination with wheat flour. We’ll save that for another column.